Being a parent can be such a rewarding and fulfilling experience. It is such a thrill to see these tiny humans grow and develop right before our eyes. Because they did not come with any instructions when we brought them home from the hospital, we often fake it until we make it! We tap into our inner child and play and create with our kids. We teach them right from wrong and how to play well with others. We also need to feed them healthy and nutritious meals which will help them grow up big and strong. After a full day of parenting and taking care of the house, we are not always up for making a full blown meal from scratch. On evenings when you are just too tired to whip up a gourmet meal, you need easy dinner ideas for your family. Here are just three for you! Soup And Sandwiches: Most kids love a grilled cheese sandwich with a cup of their favorite soup. If the weather is warmer and you want a cooler version, try a cool fruit soup and a lunch meat sandwich. Pancakes And Eggs: Show me a kid who does not like breakfast for dinner and I will change his mind! You can whip up a batch of pancakes and scrambled eggs in less than 10 minutes. Pasta And Sauce: My kids are huge pasta eaters, so pasta and sauce is a big favorite in our house. I especially love to serve them something a little different than your standard spaghetti and meatballs. That is why I love serving the delicious pastas and sauces from Giovanni Rana. 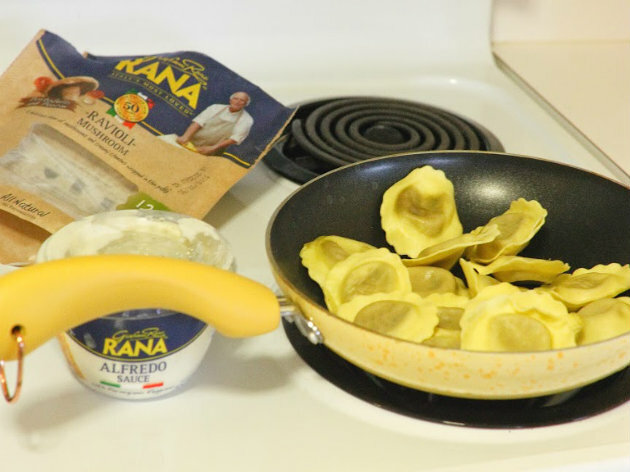 Giovanni Rana has been making fresh pastas and sauces in Italy for over 50 years. They came to the USA in 2012 and have already gained a following of fans. They make their products with such fine ingredients like Parmigiano Reggiano and Genovese Basil. Their pastas are machine made as thin as if they were handmade and the results are fast cooking times as well as the ideal pasta-to-filling ratio. They have a huge line of pastas to choose from including ravioli, fettuccine, lasagna, and tortelloni. You can find such mouth water fillings in their pastas as artichoke, chicken rosemary, prosciutto. The Giovanni Rana sauces boast such flavors as basil pesto, marinara and bolognese. 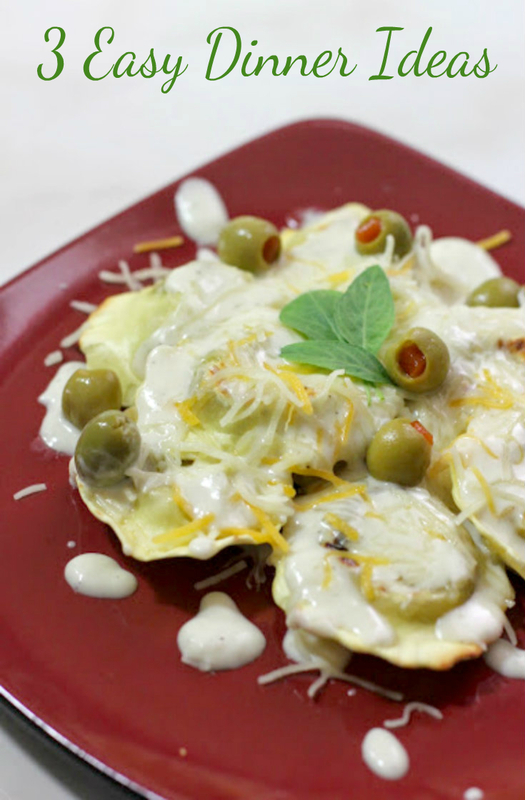 My family enjoyed the combination of the Alfredo Sauce paired with the Mushroom Ravioli. The Alfredo Sauce has tasty Parmigiano Reggiano D.O.P. from the Emilia Romagna region of Northern Italy. It is made with rich heavy cream, garlic, and other natural flavors. 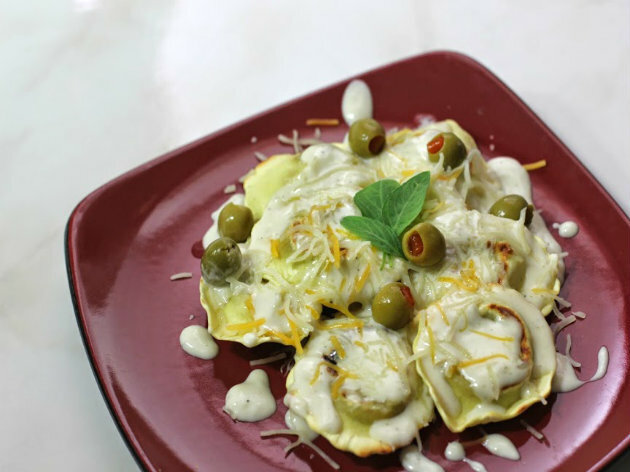 It is perfect for the ravioli, which is filled with Portobello and Porcini mushrooms and creamy ricotta and mascarpone cheeses wrapped in a thin pasta. I topped the dish with green olives, which tied the whole dish together. You can have a delicious meal the whole family will love and one serving is less than 500 calories. It is super easy to make, it is so tasty and it is healthy, which makes me feel good about serving it. You can find many great recipes on the Giovanni Rana website to make cooking for your family a snap! Be sure to follow them on Twitter and Instagram. What is your favorite easy dinner idea for your family? Previous articleHave The Best Summer Ever With Banana Boat®!